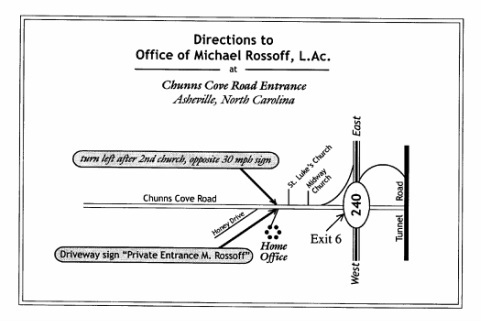 Directions to Asheville Office - Michael Rossoff, L.Ac. – Go to the end of the exit ramp. – Make a right turn onto Chunns Cove Road. – You will pass two small churches on the right. your left, is my driveway. - There is a sign “Private Entrance M. Rossoff” at the foot of the driveway. - Drive cautiously up the driveway—it is one-lane only. – At the end of the exit ramp, make a right turn onto Tunnel Road. – Go one block to the next traffic light. – Turn right onto Chunns Cove Road. Proceed under the expressway. Please note: this is NOT a MAILING address, but solely to locate the driveway. - Drive cautiously up the driveway—it is one-lane only. Thanks!